At the 2016 North American International Auto Show, Kia unveiled their vision of future by releasing the Kia Telluride Concept 2016. The gorgeously designed SUV features high-end luxury inside. Looking at the concept the speculations are that very soon the SUV market will get a better benchmark. 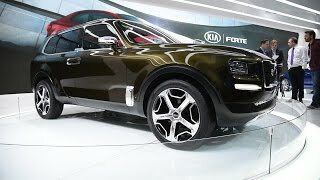 Let us have a look at the review of Kia Telluride Concept 2016 to know in detail about it. The interior of Kia Telluride Concept 2016 is loaded with tech and comfort with lots of space. There are four captain chairs in side while the last row seats can be folded to create extra space for cargo. There is lot of legroom while the footrests will make you feel more comfortable. The captain chairs come with Smart Sensors. These sensors can read the vital health information of the individual sitting and further sync with Light Emitted Rejuvenation system that can improve the energy level. Another mesmerizing feature is the Swipe-Command. It is a touch sensitive band housed over the center console (second row). The dashboard, door panels and steering wheel are created with 3D-printing. 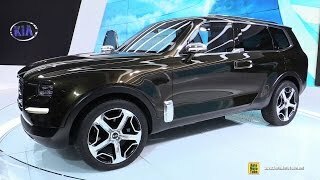 Thus rounding up the entire interior details of Kia Telluride Concept 2016 I can say, it is an impeccable amalgamation of luxury, comfort and technology without compromising with space. 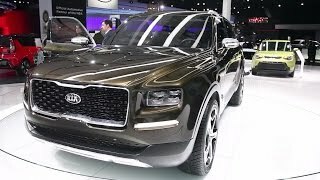 The exterior of Kia Telluride Concept 2016 is a blend of retro and modern day designing. Starting with the front fascia it has the traditional grille sitting amidst quad-LED headlamps with horizontally placed LED indicator lights. Beneath these there is a skid plate polished in metal giving the entire front fascia appealing look. Moving towards the rear end you’ll notice the high SUV while the rear portion has vertical LED taillights with integrated indicators. In all rolling over the massive 22-inch five-spoke wheels the exterior of Kia Telluride Concept 2016 is undoubtedly worth the second sight. Beneath the hood of Kia Telluride Concept 2016 is a hybrid powertrain. The model comes loaded with a 3.5 liter GDI V6 engine and an electric motor producing total output of 270 hp and 130 hp respectively. Thus the total output of 2016 Kia Telluride Concept comes to 400 hp. The performance figures of Kia Telluride Concept 2016 are still not shared but expect a powerful and luxurious ride without compromising with the fuel efficiency.